Displaying your product or automobiles in a quality showroom is essential to sales. Let’s face it, your product is probably pretty outstanding. Your customer will happily sign on the dotted line, if you can get them into your showroom and display your product in a way that will grab their attention. Lights, placement, and color palette are all very important to the showcasing properties of your retail showroom. But, presentation also depends on the showroom floor. Your showroom floor paint must be seamlessly beautiful, and durable, while at the same time providing protection to your concrete under-floor. Looking for an estimate for showroom epoxy paint? Contact the experts at Prestige Floor Coating now! No matter what you display, you need to show it off in a pristine environment. A sub-standard or poor quality showroom floor paint can expose wear and tear in a short amount of time, making your showroom appear unkempt and messy. Showroom floor paint that doesn’t hold a shine is also a turn off. Keeping your showroom sleek, stylish, and appropriate to your product means the customer will see that product in in the best light, without the distraction of a floor that needs attention, or streaks and discoloration. When your showroom floor coating is professionally applied, you’ll end up with an even, seamless, and protective floor coating that maintains its sleek and stylish appearance for years to come. In addition to appearance and durability, your showroom floor paint should protect against slip-and-fall injuries. There’s no bigger threat to your success than a pending lawsuit. And you certainly don’t want harm to come to potential customers, employees, friends, or family. A textured showroom floor coating doesn’t have to look gritty. With our personalized application process, you can still have that protective, shiny, showroom floor without risking injury or a liability lawsuit. A textured showroom floor paint will protect your clientele, as well as your business. Innovative in floor coating technology, our epoxy paint is the popular choice for showroom floors, not just in the Baltimore area, but also throughout Maryland, Virginia, Pennsylvania, and Delaware. Your showroom floor is where your most critical business takes place. If you aren’t making sales, your business is threatened. When you install Prestige professional showroom floor coating, you’ll never need to worry about continued interruption of business to repair cracks, seams, or tears in your floor. Our team of installation professionals can finish a typical application in as little as three days. We pride ourselves on happy customers, which no one appreciates more than a business owner, and we don’t consider the job complete until you’re thrilled with your showroom floor. Are you ready to get in touch with our team of experts? Contact us today to get a free estimate! For showroom floor coating, you want professional service and a superior product. Prestige Floor Coating has been serving auto shops, garages, and other showrooms for over 22 years. Our product is second-to-none and designed for complete coverage that won’t peel. Our floors are impervious to spills—liquid, oil, and abrasives won’t dull the shine or degrade your floor paint. 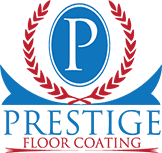 If your showroom floor needs attention, or if you’re opening a new showroom and you want quality showroom floor paint professionally applied, contact Prestige Floor Coating. Our experts will provide you with an estimate and help you choose the epoxy showroom flooring ideal for your business. Contact Prestige today and start showing off!